Prado Museum, Madrid. Jose Ribera. In general, "Baroque painting" was a reflection of the profound political and cultural changes then emerging across Europe. Baroque painting coincided, broadly speaking with the 17th century, although in some areas - notably Germany - some of its achievements did not occur until the 18th century. Although the term embraced a bewildering variety of styles, it was typically characterized by two things: a sense of grandeur (or sensuous richness), plus an overt emotional content. It was through these two elements that Baroque painters, sought to evoke emotional states in the viewer by appealing to the senses, often in dramatic ways. Why were they appealing to viewers in this way? Because life in 17th century Europe had suddenly become a competition between two powerful forces. On one side were those who supported the Catholic Church and the Divine Right of Kings - essentially, the status quo. The latter included the Kings of France, Spain, Austria and Great Britain. On the other side were those who wanted reform: they included those who belonged to the new Protestant religious movement, as well as those who believed in national or personal self-determination. The former actively used painting and other artistic disciplines to impress their congregations and subjects with the truth of their message. So Church authorities built magnificent churches, decorated with illusionistic fresco painting on the ceilings and walls, using the latest quadratura techniques and trompe l'oeil methods, in order to stimulate piety and convey an impression of the splendour of the divine. And they commissioned an endless stream of Biblical art, designed to illustrate important parts of Catholic theological dogma. Meantime, Emperors and Kings proclaimed their own authority by hiring architects to build palaces, embellished with murals, oil painting and other forms of decorative art. Reformers typically disapproved of this type of religious art, preferring instead to whitewash the interiors of churches. However, among the nations and provinces of northern Europe, a new breed of patron began to emerge - the middle class professional, merchant or office-holder - who began buying small-scale artworks in order to celebrate their growing affluence and promote their own cultural values. Thus in Holland, for instance, a new realist style of easel art boomed as the newly empowered middle classes commissioned genre paintings, still lifes or individual/group portrait paintings to show off their new status. In France, the same trend was evident in the demand for realist works by the Le Nain brothers and similar artists. Curiously, in Italy, where realist 'low brow' content had first emerged (in works by Caravaggio), the Church authorities had cleverly exploited it for their own ends, to make Saints look more human. Thus almost all Caravaggio's paintings were religious. Baroque painting - in this case landscape painting - was also influenced by the general widening of human intellectual horizons, triggered by developments in science and by geographical explorations of the globe. These two factors produced a new sense both of human insignificance and of the mysterious complexity of the natural world. Thus in the landscape painting of the period we see humans often portrayed as tiny figures in a vast natural setting. In addition to the two main characteristics of Baroque painting outlined above: (1) grandeur or sensuality - see, for instance, religious works by Peter Paul Rubens, or the elegant portraits of Anthony Van Dyck; and (2) strong emotional content - see in particular, works by Spanish Baroque Artists such as Ribera, Zurbaran, even Velazquez; we should note two other important but contradictory tendencies: (3) naturalism or realism, and (4) classicism or 'the ideal'. Naturalism is best exemplified by Caravaggio (realism by Jan Vermeer); while classicism is the main impulse in works by Old Masters like Annibale Carracci, Peter Paul Rubens, Nicolas Poussin and Claude Lorraine. See also: Classicism and Naturalism in Italian 17th Century Painting. In addition, (5) Baroque architects made full use of the mural painting skills of painters like Andrea Pozzo and Pietro da Cortona, whose trompe l'oeil fresco ceilings continue to inspire to this day. It is appropriate to begin an account of Baroque painting with its favourite genre and characteristic function: the illusionist decoration of the walls of an interior. Obviously the idea of using a wall to display a painted scene was as old as art; what was new, or almost new, was the use made of this technique of mural painting by Baroque artists. On the walls, and more especially on the ceilings, of churches and palaces they painted vast, busy scenes, which tend to produce upon the spectator a trompe l'oeil impression that the walls or ceiling no longer exist, or at least that they open out in an exciting way. This, too was not essentially new: such experiments had been made during the Renaissance, by Mantegna, and most spectacularly by Correggio in his extraordinary Assumption of the Virgin (Parma Cathedral) (1526-30). In the Baroque period, however, it became almost an absolute rule, combining as it did all the aesthetic features of the time: grandeur, theatricality, movement, the representation of infinity, and in addition a technical skill that appears almost superhuman. It showed that tendency to combine various forms of art for a unified effect which was the most distinctive characteristic of the age. Such illusionist art - among them some of the best Baroque paintings ever created - varied greatly in the stories they told - lives of saints, histories of dynasties, myths, or tales of heroes - but they were consistent in the components they deployed: architectural glories standing out against the sky; soaring angels and saints; figures in swift motion, their garments billowing out in the wind; all depicted with bold foreshortening - the perspective effect of looking upwards from below or conversely downwards from above, which makes the figures appear shorter. Such was the vitality of the genre that it continued not only throughout the seventeenth century but well into the eighteenth, invading the limits of time generally considered to demarcate the succeeding Rococo movement. Baroque painters who specialized in such murals and ceiling paintings included: the forerunner Annibale Carracci (1560-1609) - co-founder along with his brother Agostino Carracci (1557-1602), and cousin Ludovico Carracci (1555-1619) of the influential Bolognese School - who was noted for his Farnese Gallery frescoes in Rome, and his followers Guido Reni (1575-1642), Guercino (1591-1666), and in particular Domenichino (1581-1641) whose elaborate classical compositions were to influence Nicolas Poussin. Thereafter, we have Parma-born Giovanni Lanfranco (1582-1647), influenced by the frescoes of Correggio; Bernini (1598-1680), more famous as architect and sculptor; Pietro da Cortona (1596-1669) - see his immortal Allegory of Divine Providence (1633-39, Palazzo Barberini); Andrea Sacchi (1599-1661), who exemplified High Baroque Classicism, and his pupil Carlo Maratta (1625-1713). Luca Giordano (1634-1705) and Andrea Pozzo (1642-1709) - see his Apotheosis of St Ignatius (1688-94, Sant'Ignazio, Rome) - were also great exponents of the Baroque style of quadratura ceiling decoration. See also the Neapolitan decorative painter Francesco Solimena (1657-1747), whose fresco works link the late Baroque with the Rococo. For more, see: Baroque Architecture (1600-1750). Another important Italian artist was Giovanni Benedetto Castiglione (1609-64), best known for his etching, Biblical genre painting (with animals) and his pioneering use of monotype. See also: Italian Baroque Artists. In France, Charles Le Brun (1619-90) was the heir to Pietro da Cortona's decorative brilliance, which he applied to his murals at the Palace of Versailles, notably those in the Hall of Mirrors. Le Brun used his position as Director of the French Academy to exert total control over French painting (1663-83). See also: French Baroque Artists. For the golden age of interior design in France during the Baroque, see: French Decorative Art. For furnishings, see: French Furniture (1640-1792). For artists and craftsmen, see: French Designers. Naturally, painting was not confined to the walls of buildings. There was also, and indeed especially, a tradition of painting on canvas, and as with architecture the characteristics of the various national schools differed widely. They had one concern in common, however: the study of light and its effects. In spite of the great divergences between the work of various artists in the Baroque period - divergences so great that many art critics are not prepared to designate their work by a single common adjective - the thematic use of light and shade in constructing any significant work was, to a greater or lesser degree, common to them all, to the extent of being the key feature and unifying pictorial motif of the age.  The Calling of Saint Matthew (1599-1600) San Luigi dei Francesi.  The Martyrdom of Saint Matthew (1599-1600) San Luigi dei Francesi.  Conversion on the way to Damascus (1601) Santa Maria del Popolo.  Crucifixion of Saint Peter (1601) Santa Maria del Popolo, Rome.  Death of the Virgin (1601-6) Louvre, Paris.  The Entombment of Christ (1601-3) Vatican Museums, Rome. Caravaggio's temperament seems to have had closer affinities with the Spanish rather than the Italian character, and Naples, which had close connections with Spain at this period - and was also a centre of religious Quietism - was a key centre of Caravaggism influence. 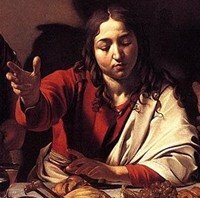 For the artist's late Neapolitan work, see: Caravaggio in Naples. For a guide to art in the city, see: Painting in Naples (1600-1700). For more detail of early 17th century art in Naples, see: Neapolitan School of Painting (1600-56). For later works, see: Neapolitan Baroque (c.1650-1700). The leading Caravaggisti in Naples included Battistello Caracciolo (1578-1635), the influential Jusepe Ribera (1591-1652) and the great female painter Artemisia Gentileschi (1597-1651), noted for Judith Beheading Holofernes (1620, Uffizi, Florence). The mature works of Francisco Ribalta (15651628) show Caravaggesque influence; the early paintings of Velazquez (1599-1660) show it, as do those of other 17th-century Spanish masters such as Zurbaran (1598-1664). But his influence extended much farther than Spain, though it is there that the master's manner was most closely followed. In Holland, Gerrit van Honthorst (1592-1656) seems to have transmitted something of Caravaggio's dramatic use of chiaroscuro to his great countryman, Rembrandt; while in France the somewhat mysterious master, Georges de la Tour (1593-1652), was a skilful, but apparently isolated, exponent of 'Tenebrism', as this use of deep shadows cast from a single source of light, to give unity to a composition, is called. Adam Elsheimer (1578-1610) was another influential representative of this tendency; while it is perhaps just worth mentioning in this connection the name of the one English tenebrist, Joseph Wright of Derby (1734-97). Of Caravaggio's Italian followers, the most prominent were Mattia Preti (1613-1669) and Domenico Fetti (1589-1624); while Salvator Rosa (1615-1673), also a Neapolitan, has affinities with him in his taste for savagery and low-life scenes, of bandits fighting and carousing among wild and rocky scenery. Salvator is particularly of interest for his importance in the development of romantic landscape; the eighteenth-century Genoese, Magnasco (1667-1749) has something in common with him. Apart from Caravaggio, there were few if any 17th century painters in Italy to rank with the great names of the fifteenth and sixteenth centuries. Although both Titian and Tintoretto did much to pave the way for the Baroque, the leading representative of the Baroque style in Venetian painting was Tiepolo (1696-1770), in whose hands illusionistic fresco painting reached its apogee in the Wurzburg Rezidenz frescoes (1750-3) in Germany. With the death of Tiepolo, the golden age of Venetian art was over. For painters in Germany and Austria during the 17th century, please see: German Baroque Artists. Before leaving Italy, we should note the existence of a separate trend in European painting, usually called the "classical" tradition. A hangover, if you like, from the Renaissance, classicism was the opposite of Romanticism, being a style of art in which adherence to accepted aesthetic ideals takes precedence over individuality of expression. In simple terms, it was a restrained, harmonious style that believed in primacy of design, rather than (say) colour or expressionism. It was closely associated with "academic art", the style taught in most of the European academies of fine arts. During the Baroque era of the 17th century, the classical tradition was personified by the French artist Nicolas Poussin (1594-1665), who spent most of his career in Rome, where his patrons included Cardinal Francesco Barberini (1597-1669), and the cardinal's secretary Cassiano dal Pozzo (1588-1657). Poussin is probably best known for his mythological painting - see, for instance, his Abduction of the Sabine Women (1634-5) and Et in Arcadia Ego (1637) - although he was also an important pioneer of classical arcadian landscape painting - a genre dominated by another French painter based in Rome, Claude Lorrain (1600-82), who instigated the "Claudean" style. (Note that Claude Lorrain was especially influenced by the German Baroque art of Adam Elsheimer.) Like Poussin and Claude, Simon Vouet (1590-1649) also spent a major part of his career in Rome, before returning to Paris as court painter to King Louis XIII. He was noted, in particular, for his muted style of Baroque painting, which avoided both the extreme naturalism and drama of Caravaggio, and the contrived painterly effects of the more intense Italian Baroque art. In Flanders and Holland, painting had developed flourishing local schools that so far from being backwaters were well in the van of artistic exploration. Flemish painters had created - or at least greatly enhanced - two types of picture concerned with the faithful representation of domestic life and everyday reality: genre painting and still life. Neither had any equivalent in Italy - where there was indeed no demand for such pictures. It was the Flemish painters who had exported the technique of oil painting, formerly unknown to the artists of the early Italian Renaissance. Now they were quick to fuse their own tradition with that arriving from Italy - a marriage which was to produce works among the greatest achievements in the history of art. This development had different results in Flemish painting compared to that of Holland, and in each case was associated with the two profoundly different people: namely Peter Paul Rubens (1577-1640) and Rembrandt (1606-1669).  Judgement of Paris (1636, National Gallery, London).  Return of the Prodigal Son (1669, Hermitage Museum, St Petersburg). For more details, see: Flemish Baroque Art and Dutch Baroque Art. See also: Dutch Painting (17th century) and Dutch Realist Artists. By the late 1570s, Rome was no longer the centre of the world. The Italians were wearing Spanish costumes, and the heart of the Counter-Reformation was in Spain. The Escorial was being built as the new citadel of the Faith, and the palaces of Toledo were being turned into monasteries and convents. Beauty was giving way to holiness. In the spring of 1577, the resident Mannerist El Greco (1541-1614) found in the Spanish city of Toledo the familiar shapes of his Cretan home, the buildings of the Mohammedan East, all in the urgent and emphatic Spanish form. He spent two years in painting his first great work, the altarpiece for San Domingo el Antiguo. The passionate and often extravagant spirit of the Baroque had now possessed him. His wooden panels and modest canvases were forgotten; he now painted pictures of enormous dimensions. Among El Greco's greatest religious paintings of the following period was the representation of the miracle which was said to have occurred during the funeral of Count Orgaz, when St Augustine and St Stephen appeared and discharged the duties of the clergy, In grey and yellow, black and white, the colours of the stormy sky, El Greco has painted the miracle in an unearthly light, not as a supernatural, but rather as a supremely natural event, to which the whole Spanish people, its priests, its nobles, and its faithful, bear witness by their presence on the solid floor of the church. See: Burial of Count Orgaz (1586-88). Some have called El Greco's pictures ascetic, ecstatic, cruel, nerveless and colourless. Nevertheless, his Portrait of a Cardinal (1600) of Don Fernando Nino de Guevera - like that of the Grand Inquisitor is painted with the strongest colouring; it is only in El Greco's saints that we find deliberate distortion and an unearthly radiance. When he paints ordinary human beings, like his daughter, it is as though they were reflected in a mirror. The final development of El Greco's art places him, in spite of his peculiarities, in the heart of the Baroque period, as he abandons Renaissance laws of composition and colour and moves toward the international art of the Baroque period. Other important members of the Spanish Baroque school included: Jusepe (Jose) de Ribera (1591-1652), the Naples-based Spanish caravaggesque artist, noted for his realist paintings on religious and mythological subjects; the devout Francisco de Zurbaran (1598-1664), noted for his intense religious pictures, still-lifes, and mastery of tenebrism; Diego Velazquez (1599-1660), official painter to the Spanish court in Madrid who combined realism with the Baroque emphasis on light and illusionism.  Waterseller of Seville (1618-22) Apsley House, London. 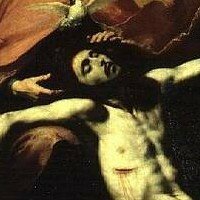  Christ Crucified (1632) Prado, Madrid.  The Surrender of Breda (1634-5) Prado, Madrid.  The Rokeby Venus (1647-51) National Gallery, London.  Portrait of Pope Innocent X (1650) Doria Pamphilj Gallery, Rome.  Las Meninas (1656) Prado, Madrid. Other important painters of the Spanish School include the sentimental Seville painter Bartolome Esteban Murillo (1618-1682) whose religious works and genre paintings were influenced by Velazquez, Zurbaran and Caravaggio. For details, see: Spanish Baroque Art. Baroque painting can be seen in the best art museums around the world.  For more about the origins & development of painting/sculpture, see: Homepage.